I am new to RC planes. My son and I are building an FT Explorer. We are currently working on binding the Spektrum AR410 receiver to the Spektrum DXe transmitter. However, we aren't having any luck. When I plug in the receiver to the ESC & fully-charged battery I get no flashing light (no light at all). That is with the button held down or not. As I said, I'm completely new to this. Am I doing something wrong? The instructions say that I need a flashing light in order to bind it to the transmitter. Thanks for any information you can provide. Can you supply a pic of how you are connecting it? Sometimes people can get confused and plug the ESC lead in reverse as it will easily fit 2 ways! If you connect a motor to the ESC does it "Beep" to signify that power is connected but it is not getting any input from the Rx? What make/model ESC are you using? Assuming you have it plugged in correctly, does it have a BEC capable of powering your RX? I have tried the lead both ways. Currently the yellow line is on top. There is no beeping. As for the ESC, it is a BLHeli 20A OneShot 125 (in photo). All of these parts came with the kit we purchased from FliteTest so I'm assuming they are the correct parts. Let me know if I am wrong. The instructions say that I need a flashing light in order to bind it to the transmitter. You mighty try the plug in another channel. FYI: Wire come in several color codes. Red is always positive. The darkest color (black or brown) is negative. The lightest color (white or yellow) is signal. I'm unfamiliar with the newer Spektrum RX units, as I prefer the Lemons, however your setup looks correct to me. As @Merv said, you could try it in Port 1 and see what happens. Spektrums are usually TAER, Throttle, Ailerons, Elevator, Rudder in that order, so Port 1 would be throttle. Ok! First have you charged the battery? Also I could be wrong but I would think that you should have the ESC plugged into channel one rather than the battery port. The battery port is used when using a separate battery pack for the Rx and not the BEC through the ESC. Also when using gas models when the throttle is operating a servo rather than an ESC. Just not 100% certain the throttle channel on the Spektrum is ch!, (about 90% sure only). Do NOT ever plug a LiPo battery into the Rx Battery port without using a BEC or ESC. 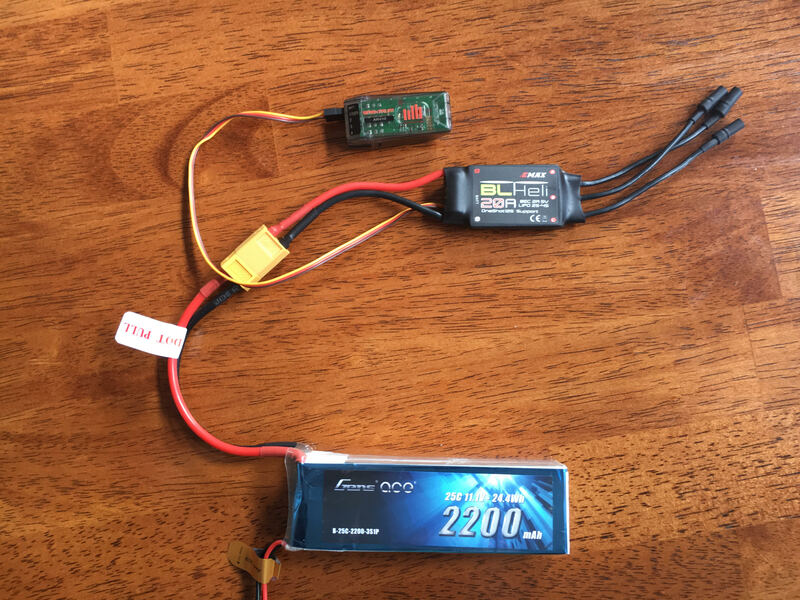 LiPos are too high in voltage and will damage the Rx. Hmm. The battery is fully charged. And, I have now tried port 1 as well as all of the other ports. Perhaps the light is faulty? The possibility is very slight or remote! Can you connect a motor to the ESC and listen for any "Beeps" it might make. The ESC uses the motor windings to generate the tones! Still not sure what the issue is and if the ESC is getting voltage and even if it is supplying the 5V required by the Rx! Does the ESC feel warm to hot with the battery connected and the lead plugged into the Rx? If you have a volt meter, you should check the voltage that the ESC's BEC is putting out. If it's ~5V your Rx is probably toast. Otherwise it's probably the ESC. No beeps and no heat generated from the ESC. Is it not getting power? The charger is saying the battery is 100%. OK! If, (Which I doubt) the Rx has a dodgy light ONLY! Then plug a servo into the Rx and it should "Kick" or make a tiny movement when power is first applied. If not then the ESC is not supplying volts to the Rx or the Rx has SERIOUS damage. - Normally it would be an ESC issue! As @ElectriSean asked do you have access to a multimeter and a knowledge on how to use it? No movement with the servo. I just got a multimeter from my neighbor. I don't know how to use it though, so I'll review the instructions and give it a try. Where do I touch the leads to from the multimeter? The motor connections? First thing is to disconnect the ESC from the Rx and measure between the red wire and the brown wire on the plug that goes to the Rx. Red multimeter lead on the red wire and black on the brown. It should read +5 Volts or very close thereto. If it does not show 5 Volts then disconnect the ESC from the battery and measure the battery volts to ensure that you have 12 volts or thereabouts available at the plug to the ESC. Then let us know what you find. If you do have + 5 Volts at the lead of the ESC that goes to the Rx then plug it into the Rx on port one and measure the volts again through the back of the lead you just plugged into the Rx. Make sure that the meter probes are touching the metal of the pins in the back of the connector! OK. We have 4.96 coming out of the ESC lead and just about that coming out of the pins from the Rx. Light issue? 12.5 from the battery. Does it read as Positive volts or negative volts? If positive volts the ESC is OK and the volts to the Rx are OK. Next plug in a servo and check that when you disconnect the battery from the ESC and then plug it in again the servo should kick! If not then I suspect your Rx is fried! Yes. Positive volts and the servo does kick. An AR610 has the Binding terminals followed by the throttle terminals. As long as the esc is in the "throt" or throttle terminal and is oriented properly, you can put the binding key in the terminal at the ("Bind")bottom which is next to the "throt". No prop on the motor, safety first. Plug in the battery and the binding light should flash. I have a few Spektrum receivers but mostly Lemon. I just went and got an ar620, the slightly larger brother to yours, bound to my dx6i just fine. Just to be clear you are holding the bind button in for several seconds correct? My first couple attempts I just pressed the button instead of holding it and it wouldn’t go into bind mode.